Bioni Samp is a British artist, musician, inventor and beekeeper. He was born in Wakefield and spent his childhood in Castleford, West Yorkshire, England. He studied in Wakefield, Surrey, Dundee and lived in Glasgow, Scotland from 90-94. Now lives in London, England. He studied; ‘Art and Design’ at Wakefield District College. ‘Audio Visual Studies’ (Film, Video and Sound) at Farnham, West Surrey College of Art and Design (now University for the Creative Arts) and post-grad. ‘Electronic Imaging and Sound’ at Duncan of Jordanstone College of Art and Design, University of Dundee, Scotland. Bioni Samp’s first major installation was in 2013 at Barbican Arts Centre in London. His ‘Hive Synthesis’ 24 hour installation and performance was part of the Hack The Barbican Festival summer show. Other performances and installations of his ‘Hive Synthesis’ or ‘Beespace’ works followed at UK performance venues, galleries and festivals. In 2014 ‘Hive Synthesis’ was performed to Human Beeing, a large, outdoor, video projection mapping by Berlins’ The Constitute, in Ropewalks Square, FACT, Liverpool in 2014. ‘As a electronic music producer and seasonal beekeeper. I was inspired to learn more about bee frequencies and make a creative work that incorporated these bee frequencies in the hope of raising awareness about bees and their increasingly fragile ecology system’. From 2013 to 2019 Bioni took his ‘Hive Synthesis’ show on tour, performing and exhibiting in Ottawa, Canada at Gallery 101 and the National Museum of Nature. Harplinge, Sweden at Harp Art Lab. Slovakia at Banská Štiavnica Gallery. Prague, Czech Republic at školská 28 and Nová Perla. Wroclaw, Poland at the 16th Media Art Biennale. Linz, Austria at Eleonore and STWST48 during ARS Electronica. Liverpool at FACT, Bioni Samp installation in group show: Hybrids: Interspecies Collaboration in Craft and Design, @NationalCraft The National Centre for Craft & Design Sleaford, UK. reROOted festival, part of Hull 2017 Year of Culture, Sonic Dreams Festival, Waterford Ireland 2017, Primal Uproar 3 onboard the MS Stubnitz, Hamburg 2018, Piksel Festival Norway 2018 and many other various live shows in London and the UK. From 1995 he has published studio recordings, a series of experimental music releases, on UK and international record labels (several on vinyl) : Aconito, EMIT (UK) Harthouse (DE) Philtre/Kompakt, Instinct, Minimalizm (USA) RoHS Prod (FR) Musica Dispersa (ES) and Noise Music (BR). From 2006 – 2018 he invented a ‘Hive Synthesiser’, which he has performed extensively with. The ‘Hive Synthesiser’ is an ever expanding, modular synthesiser made from recycled electrical components, that emulates ‘bee sounds’ and uses honey as a organic electrical resistor. He is also the co-designer of two ‘Beehouse’s’ in north London. One beehouse is on a urban farm in Islington and the other in a London Park. Both are experimental community beekeeping sheds with disabled access, for which he received a ‘Community Champions’ award by the then Mayor of London’s office in 2008. In 2016 a short 360 video clip was featured on, ‘BBC Click 360: The world’s first entirely 360 TV episode’. The clip is taken from ‘The Resistance Of Honey’ a BBC 360 video documentary featuring Bioni Samp’s art, music and sound design. Directed by Peter Boyd Maclean. The ‘The Resistance Of Honey’ 360 video has recently been shown at I-Docs Documentary Festival Bristol 2016, Sheffield Documentary Festival 2016 in the BBC 360 cinema area, FoST Festival, NYC, Raindance Film Festival London 2017, where it was ‘Nominated for Best Virtual Reality Sound Experience’. Bioni Samp installation in group show: Hybrids: Interspecies Collaboration in Craft and Design at The National Centre for Craft & Design Sleaford. UK. 2016. He continues to perform, record, keep bees and exhibit in Europe. Bioni Samp is an artist, producer and video maker originally from near Leeds, Yorkshire. He currently resides in London. He creates experimental electronic music, live and on recordings. He also seasonally works with bees. When not beekeeping, he makes custom audio software and hardware, which he uses in creating his music. Bioni Samp has been publishing his work since 1995 and has had releases on various labels: Aconito, EMIT (UK) Harthouse (DE) Philtre/Kompakt, Instinct, Minimalizm (USA) RoHS Prod (FR) Musica Dispersa (ES) and Noise Music (BR). Growing up in Yorkshire to a backdrop of industrial decay next to rural beauty, inspired me to create my own electronic landscapes using cassette, tape loops, bass guitar and a Roland SH-101 synthesiser. I was influenced and inspired by other Yorkshire locals, Cabaret Voltaire, early Human League, their harsh electronic sound and slide based multimedia live shows. After studying video and sound in Scotland, it was in Glasgow that I really started to developed my own work and built an early ProTools based electronic studio. Many djing, live electronics gigs and releases followed. Over the years I have continued to research and experiment with stereo / binaural, producing recordings and performing live with extreme stereo processing, using mainly my own home made equipment. I have been invited to perform my live electronics in Canada, Sweden, Slovakia, Czech Republic, Poland, Austria, Bristol, Brighton, Portsmouth, Liverpool, Birmingham, Sleaford and London. I like to create something new for each live performance, my sound constantly evolving between ‘ambient / experimental / field recordings / noise / techno‘. Bioni Samp is an artist, producer and video maker originally from near Leeds, Yorkshire. He currently resides in London. He creates experimental electronic music, live and on recordings. He also seasonally works with bees. When not beekeeping, he makes custom audio software and hardware, which he uses in creating his music. Bioni Samp has been publishing his work since 1995 and has had releases on various labels: Aconito, EMIT (UK) Harthouse (DE) Philtre/Kompakt, Instinct, Minimalizm (USA) RoHS Prod (FR), Musica Dispersa (ES) and Noise Music (BR). Growing up in Yorkshire to a backdrop of industrial decay next to rural beauty, inspired me to create my own electronic landscapes using cassette, tape loops, bass guitar and a Roland SH-101 synthesiser. And at the same time making images to these early compositions with Super 8 film and scratch videos made on an old VHS edit suite, while studying Art and Design at Wakefield College. What got you influenced in the beginning? I grew up near the same town where Henry Moore was from and was taught about him at school. So abstract sculptures, shapes and forms were strangely next to coal mining studies on my curriculum. My father and uncle were Super 8 enthusiasts. I remember shooting film at a very early age of the amazing light and landscapes of Yorkshire, which still inspires me today. Events like Sheffield Media Show always had interesting work on. An early video magazine called DoubleVision. 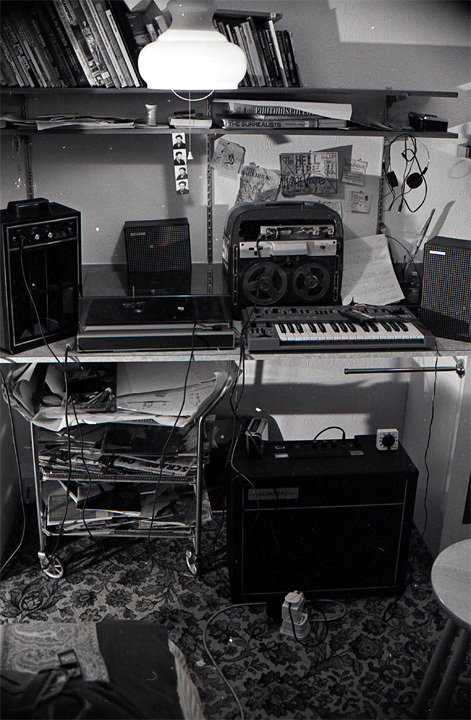 After studying video and sound in Scotland at Duncan of Jordanstone, it was in Glasgow that I really started to developed my own work and built an early ProTools based electronic studio. I was inspired by live encounters with the then emerging and established electronic music producers, including – Cabaret Voltaire, Juan Atkins, Carl Craig, 4 Hero, Winston Hazel, Green Velvet, Speedy J, Sweet Exorcist, Richie Hawtin, LFO, Unique 3, Fini Tribe, Slam, Zoviet France, Todd Terry, Ubik, Jeff Mills, Kraftwerk and Aphex Twin. It was here I started DJ-ing more seriously, at Glasgow’s Pussypower events, alongside friends Terry and Jason, DJ Q (Paul Flynn) and Twitch (Optimo). I was also organising regular experimental happenings with guest musicians, films and performance called Sensuology. The track was re-released on a best of EMIT 2000 on Instinct Records (US) (Moby’s first label). Today P Eye Eye are now regarded as 90s ambient / experimental music pioneers with their own unique sound, having been one of the first to use the RSS. (Roland Sound Space system) a ‘Revolutionary sound processor that creates a three-dimensional sound environment using conventional two-channel playback’. Photo credit: Roland Museum. Over the years I have continued to research and experiment with stereo / binaural, producing recordings and performing live with extreme stereo processing, using mainly my own home made equipment. A mixture of DIY electronics, MaxMSP, Pure Data, Bela, Gen on the Owl modular and various vintage synths programming. What tracks have you coming out next and what remixes have you done? Out Now is Bioni Samp – Pyramids Along The Caulder – Aconito Records 2015. Its a 6 track ep with a range of ambient, experimental and techno tracks. All the tracks feature some form of synth, fx filters, or software process which i have created. The support so far has been really amazing and I am still getting great new feedback every week about how people really seem to enjoy listening to my music as a concept albums. Thank you everyone!!! It means so much to me as I didn’t make it in a few hours. It took over two years of recording and processing to finally put it all these together. Here are the albums credits. Bioni Samp played the following instruments: Hive Synthesiser (9 Oscillator prototype) Electronic Beesmoker, BeeVerb, BFX, Binaural Beeframe, Yamaha Fretless Bass, Maplin 3800, Casio CZ 1000, Mini Sitar, MFB Drum Machines, Yamaha RX5, Roland 727, Crumer Organizer, Roland SH101, Make Noise Rene, Wiard Anti-Osc, 8 bit delay slinky, Berhringer Pedels, Faderfox Micromoduls, Ableton Max For Live 8, Max MSP 5, Schwarzonator, Granulator by Monolake, Pure Data, RME A2D, Linux only DIN, SuperCollider, tape recorders and microphones. Also out on Aconito Records is Nax Acid & Bioni Samp – Ghostbus EP. Vinyl 12 inch and Beatport release. Bioni Samp has released several white-labels on his own Beespace Recordings and a featured release on Beatport was the Bioni Samp – ‘I Love Honey EP (2006)’. Bioni Samp then went on to remix both Brazil’s Anderson Noise, with releases on the German label Harthouse. And Chicago’s Jordan Fields released on his Minimalizm label. Also contributing a vinyl locked groove… Bioni Samp – ‘Silkwoods Loop’ to Minimalizm V4/V3 (7″ Vinyl). Also forthcoming on Philtre Audio Research is the three track Bioni Samp – ‘Teleport Voyager’ EP. Three original mixes and remixes by Claus Muzak and Textbeak. This was originally released by Kompakt mp3 before it went bust 😦 It will be available on a new distribution network soon. I have been producing tracks and remixing anyone whose music I connect with, sometimes for labels but sometimes entering remix competitions to give me chance to explore a new style or experimental treatment with tracks I like. Here they are listed, newest tracks at the top. I was inspired to raise awareness about the plight of bees after keeping them in London. It’s me performing on stage, improvising my music and video from my experimental films. Its is a study of the bee as social insect and uses bee frequencies. It is hard to describe in a few words and is best seen live. I call it ‘INSECTEC’. Its live performance with sound, video, live processing, using MAX/MSP/Ableton M4L software and custom made electronics. I’ve developed a ‘Electronic Beesmoker’ which uses Max/MSP as a kind of breath controller for audio, midi and video and a ‘Hive Synthesiser’, a modular 6 oscillator design which are all used in creating my experimental electronic music and am always working on new instruments to make my kind of music. My new film/performance is called Henry & Moor and is about sonic sculpture in Yorkshire, but I am still working on it. I did a screening of it in 2013 at Civictv83 with live soundtrack featuring my old Yorkshire friend Stephen Thrower on treated Saxophone. My newer film ‘Electronic Journey To Avebury’ has been kindly featured on the Goldsmiths Uni. online curated space Photomediations. It’s been shown at Hackney Wicked Festival 2013 by projecting it on a canal bridge, also recently in Mexico City, Ottawa, Prague and at the CTM Festival in Berlin. And more screenings are planed soon. Where are you performing live? Bioni Samp has performed at venues including: The Rhythm Factory, Stylistik, The End, Hidden, Leisure Lounge, Cross Bar, Tactical, Jaguar Shoes, George IV, Horse Hospital, The Asylum Club, ILLFM @ The Others, The London Stone, Alphabet, Divus, Complex, 333 Old Street, Noise=Noise, Hackspace London, Fluid Bar, SHNDG Portsmouth. EPROM Southend Fringe Festival, WTFIH Festival Brighton, Hackspace London, Poltroon, London, Tempting Failure, Bristol, MS Stubnitz at Canary Wharf London, Barbican Arts Centre, Goldsmiths Uni, Digihub Brighton, National Museum Nature, Canada, Bzzz! Festival Sweden, VINYL, Deptford London, Thames Boat Party, Vauxhall, London. Recently I have been invited to perform my live electronics in Canada, Sweden, Slovakia, Czech Republic, Poland, Austria, Liverpool, and London.. recent list here etc. Any views on new technologies? Do you incorporate them into your performance? Love all the new technology especially Ableton M4L, Max / MSP Jitter, Faderfox midi controllers, combined with my vintage and my home-made synths. I like making new kinds of synths, FX and video samplers in Max/MSP and transferring them to hardware synths. It gives me chance to synch creatively with my videos. Bioni Samp Radioshow / Beespace Transmissions, what is it all about? I present my own intermittent radio show called Beespace Transmissions, where I stream live. I play live and also feature tracks made by producers and labels I am involved with. I like to take people on a experimental journey into the night. It started on community and pirate radio and evolved over time to now being streamed into a virtual world. Which producers do you find inspiring? To get out of the studio more often and perform live with my own video visuals, to develop my performance. To become a better artist, producer, film-maker, Max/MSP programmer, mixing engineer and midi hacker. Oh and to visit some more Neolithic places. he he !!! How would you describe your style/production? Experimental… My music is constantly evolving through electronic grooves, industrial soundscapes, video matrix’s, magnetic distortion, ambient field recordings, bass waves and circuit-board rhythms. I’ve a strict policy of not releasing tracks which are not analogue mastered. Plug-in digital mastering is usually awful. Analogue is always best. I have been fortunate to have had tracks mastered (for vinyl and digital) by mastering engineers I rate highly and at some of the best mastering houses in the world including Calyx mastering in Berlin and Transition mastering in London. Enjoy… the sound quality! How can people contact you about remixes or send you a track for DJing with in clubs or on your Beespace Transmissions radio show? Send me demos via Soundcloud to listen to for a Bioni Samp Remix or if you think I’d enjoy playing your tracks out when I DJ live or on the radio. I only do a few remixes per year so can only choose material i identify strongly with. I add dirt to other peoples tracks by producing remixes and I enjoy anything electronic and can usually incorporate tracks i like into my live dj sets, some may have to be re-edited, remixed or distorted to fit with my style ;). from Stylistik interview & press releases inc. DJ Mag review.